On February 4th, 2013, the San Diego Theatre Critics Circle hosted the 11th Annual Craig Noel Awards last night to a crowd of nearly 500 of San Diego’s most dedicated theatre lovers, producers and participants. Among those were some of the larger theatre companies in the city including The Old Globe, Moxie and La Jolla Playhouse. The Old Globe took home 10 awards from the shows in its season, the most by any theatre company. The new musical Allegiance, which had its World Premiere at the Old Globe in September of 2012, took home the top award, for Outstanding New Musical, along with two other awards, for Outstanding Featured Performance Male, and Outstanding Orchestrations. Other notable wins for the Globe including Outstanding Resident Musical for The Scottsboro Boys, and Outstanding Resident Musical for The Recommendation. Allegiance also won Outstanding Featured Performer in a Musical for a Male for Michael K Lee’s heart-wrenching portrayal of a conflicted Japanese American, Frankie Suzuki. Allegiance won its third award, Outstanding Orchestrations for the work of Lynne Shankel. This third award tied Allegiance for the second-most awards of any single show, and for the highest number of awards for any new musical in the season. 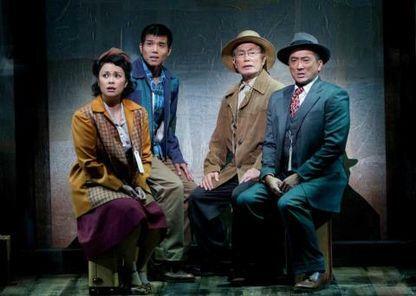 Allegiance, starring Lea Salonga and George Takei, is currently aiming for a Broadway run in the 2013-2014 season. Founded in 1983 and re-established in 2002, the San Diego Theatre Critics Circle is an independent, nonprofit organization of print and online theater critics dedicated to open and honest dialogue about theatre in San Diego County and to honoring artistic excellence. The members of the Circle are professional critics writing for daily newspapers, magazines, alternative weeklies, entertainment trade publications, broadcast media, and web sites in San Diego County. The Circle’s annual awards for outstanding San Diego theatre are named for Craig Noel, founder and longtime artistic director of The Old Globe.